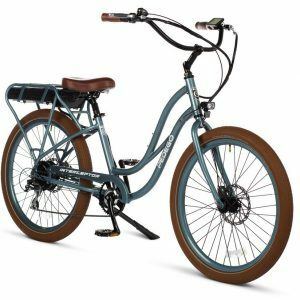 On my latest adventure, I was able to have the opportunity to go on a Santa Monica bike tour Our amazing tour guide, Barb Wittels is the owner of Pedego Santa Monica and Pedal… Or Not Electric Bike Tours. Barb showed my host sister and I around the beautiful community on a personal tour. 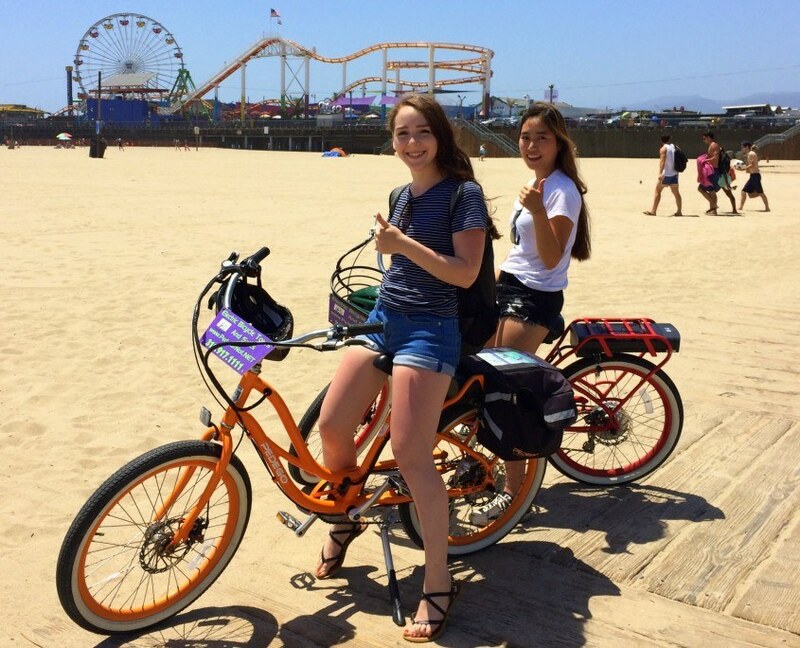 We breezed down the famous Santa Monica boardwalk, relaxing on our 24″ Comfort Cruisers. Along the way, we stopped at many fantastic spots to snap photos. The pier acted as a great backdrop to our bright red and orange Pedegos. Barb is extremely knowledgeable about the surrounding buildings, supplying us with an abundance of interesting information as we pedaled with the help of the throttle along the boardwalk. A very vibrant purple and pink house we passed was Barbie’s real dream house; the creator of Barbie had previously lived there! At our stop at the Annenberg Community Beach House, we heard the story of the land and building. Barb is a fantastic storyteller, keeping us completely enthralled at our look back at Santa Monica history. Along the tour, we rode through Venice Beach, additional power making the long distance ride go by fast. We had a quick break at the skate park. Terrifying stunts by people of all ages were being made on the concrete slopes. And a trip to Venice beach wouldn’t be complete without a stop at Muscle Beach. This famous spot was made popular by Arnold Schwarzenegger, who previously frequented the outside workout center. On our route back to the store, the views of the stunning Venice Canals provided not only a lovely riding path but also surprising history. Barb calls this installment of the tour “the gem of the tour” which was very true. We learned all about how the Canals were created and what had become of them over the years. Then we zoomed back to the store at 20 m/h (32km/h)! After two and a half hours, our jam-packed tour came to an end. We were very grateful to have Pedego electric bikes because they made the ride much more enjoyable. It was amazing that we still had a few bars of power left on the battery, proving that Pedego bikes are made for long distances! I am so thankful for the amazing opportunity and the kindness Barb extended to us. She was an extraordinary tour guide that gave many tips on how we should do our new upcoming tours in Qualicum Beach – so stay tuned. Or, call us to sign up for your local foodie tour or a relaxing nature ride!